The light chains (KLCs) of the heterotetrameric microtubule motor kinesin-1, that bind to cargo adaptor proteins and regulate its activity, have a capacity to recognize short peptides via their tetratricopeptide repeat domains (KLCTPR). Here, using X-ray crystallography, we show how kinesin-1 recognizes a novel class of adaptor motifs that we call ‘Y-acidic’ (tyrosine flanked by acidic residues), in a KLC-isoform specific manner. Binding specificities of Y-acidic motifs (present in JIP1 and in TorsinA) to KLC1TPR are distinct from those utilized for the recognition of W-acidic motifs found in adaptors that are KLC- isoform non-selective. However, a partial overlap on their receptor binding sites implies that adaptors relying on Y-acidic and W-acidic motifs must act independently. We propose a model to explain why these two classes of motifs that bind to the concave surface of KLCTPR with similar low micromolar affinity can exhibit different capacities to promote kinesin-1 activity. Transport of cellular components along microtubules (MTs) is important in virtually all cell types and required for normal cellular activities. For neuronal function, MT-based transport is particularly critical due to the long distances that need to be travelled and strong links exist between intracellular transport and the pathogenesis of neurological diseases (Chevalier-Larsen and Holzbaur, 2006; Franker and Hoogenraad, 2013). The kinesin-1 motor, is responsible for the anterograde (plus-end directed) transport along MTs of a wide range of cargoes such as protein complexes, ribonuclear protein assemblies, vesicles, and organelles (Hirokawa et al., 2009). Defects in kinesin-1-mediated transport have been linked to various neurodegenerative diseases including Parkinson's, Huntington's, Alzheimer's, and hereditary spastic paraplegia (Mandelkow and Mandelkow, 2002; Morfini et al., 2016; Morihara et al., 2014). At the molecular level, kinesin-1 is a tetramer consisting of two ATP-dependent motor-bearing heavy chains (KHCs) and two light chains (KLCs) that in mammalian cells are encoded by three (Kif5A-C) and four (KLC1-4) closely related genes, respectively, with distinct cell and tissue expression profiles. When not engaged in active transport, kinesin-1 is maintained in an autoinhibited state resulting from an intramolecular interaction in which the C-terminus of a single KHC tail binds at the N-terminal motor dimer interface preventing the structural transition required for ADP release (Kaan et al., 2011). Regulatory KLCs interact with KHCs using their N-terminal coiled-coil (CC) region that precedes an unstructured region followed by a cargo-anchoring tetratricopeptide repeat domain (TPR) and a disordered C-terminal region that varies considerably between isoforms (Figure 1A). The unstructured region N-terminal to KLCTPR (TPR domain of KLC) features a leucine-phenylalanine-proline (LFP) triplet followed by Asn/Ser and flanked by negatively charged Asp/Glu residues that is highly conserved in all KLCs isoforms. We have shown that this 'LFP-acidic' region engages in cis with KLCTPR contributing to the maintenance of the autoinhibited state, and is likely important in cargo-driven activation (Yip et al., 2016). KLC1TPR binds Y-acidic peptides with low micromolar affinity. (A) Schematic diagram of KLC. Residue numbers are for the human version of the KLC1 isoform. Important domains and protein regions are highlighted as well as key interacting partners. The LFP-acidic region (in black) engages in cis with KLCTPR (in gold, numbers correspond to the individual TPR repeats) contributing to the auto-inhibited state. (B) Schematic diagram of the JIP1 cargo adaptor and TorsinA proteins. They use their respective C-terminal regions to bind to KLC1TPR. The JIP1C-term (in magenta) is located immediately downstream of the PTB domain that is responsible for APP binding while TorsinAC-term (in violet) is an integral part of the AAA+ domain to which LULL1/LAP1 activators bind. (C) Multiple sequence alignment of JIP1C-term and TorsinAC-term peptides. 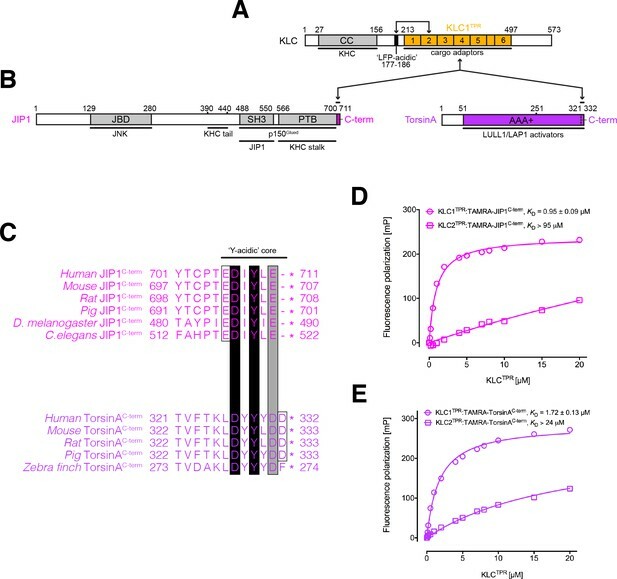 Functionally unrelated JIP1 and TorsinA proteins share a conserved Y-acidic C-terminal region. Totally conserved Asp and Tyr residues (highlighted by black boxes), a conserved acidic residue (Glu/Asp highlighted by the grey box), and additional acidic residues (empty boxes) identify a common Y-acidic core. Residues upstream the Y-acidic core are not conserved. (D) Fluorescence polarization (FP) measurements indicate that TAMRA-labelled JIP1C-term binds with high affinity to KLC1TPR but not to the highly homologous KLC2TPR. (E) FP measurements show that TAMRA-labelled TorsinAC-term behaves similarly to JIP1C-term with a strong preference for KLC1TPR. The KD values reported in (D) and (E) refer to measurement carried out in buffer containing 150 mM NaCl. Error bars in the FP graphs are not visible as they are smaller than the size of the data point symbols. The process of motor activation in response to cargo recognition occurs via molecular mechanisms that are incompletely understood. However, adaptor (or scaffolding) proteins that provide a molecular link between kinesin-1 and its cargoes play a clear role in coordinating motor's activity and driving transport (Fu and Holzbaur, 2014). While vesicular cargoes interact with adaptors that can bind to multiple sites on both KHCs and KLCs, diversity of recognition is often mediated by the interaction of the KLCTPR domain with short disordered peptide sequences on the adaptors. One important class of such peptides features a tryptophan residue flanked by aspartic or glutamic acid residues (for example, EWD). Experimentally validated 'W-acidic' recognition motifs are found in a growing list of adaptors including the SifA-kinesin interacting protein (SKIP), a critical host determinant in Salmonella pathogenesis and a regulator of lysosomal positioning, the neuronal protein calsyntenin-1 (CSTN-1), dynein intermediate chain (DIC), nesprin-2, gadkin, and cayman ataxia protein (BNIP-H) (Aoyama et al., 2009; Araki et al., 2007; Dodding et al., 2011; Kawano et al., 2012; Konecna et al., 2006; Ligon et al., 2004; McGuire et al., 2006; Schmidt et al., 2009; Wilson and Holzbaur, 2015). Remarkably, W-acidic motifs have an intrinsic capacity to promote kinesin-1 activity (Dodding et al., 2011; Farías et al., 2015; Kawano et al., 2012; Pu et al., 2015). We have solved the X-ray structure of KLC2TPR in complex with the W-acidic peptide of SKIP (SKIPWD, sequence TNLEWDDSAI) thus deciphering the structural basis for the recognition of this important class of adaptor peptides by kinesin-1 (Pernigo et al., 2013). Despite the importance of W-acidic motifs, cargo adaptors exist that do not feature this type of recognition sequence. A prominent example is the c-Jun NH2-terminal kinase (JNK)-interacting protein 1 (JIP1) that is involved in the anterograde transport of the amyloid precursor protein (APP), a key determinant in Alzheimer’s disease (Matsuda et al., 2001; Scheinfeld et al., 2002). The most C-terminal region of JIP1 (sequence YTCPTEDIYLE, JIP1C-term) has been shown to be necessary and sufficient for kinesin-1 binding and, in contrast to W-acidic sequences, JIP1C-term has a strong preference for the KLC1 isoform, rather than KLC2 (Kawano et al., 2012; Verhey et al., 2001; Zhu et al., 2012). Interestingly, JIP1C-term binding to KLC1TPR is not sufficient to promote kinesin-1 activity (Kawano et al., 2012). Indeed, KHC binding by JIP1 as well as the cooperation of additional proteins, like FEZ1 or JIP3, is required for cargo transport (Blasius et al., 2007; Fu and Holzbaur, 2013; Fu and Holzbaur, 2014; Hammond et al., 2008; Satake et al., 2013; Sun et al., 2017). Using a structural approach we show here how kinesin-1 selects adaptors, like JIP1, that rely on an alternative 'Y-acidic' (tyrosine-acidic) motif for recognition. We also show how the solenoid-shaped KLCTPR domains utilize distinct, yet partly overlapping, portions of their concave surface to select between W-acidic and Y-acidic motifs in an isoform-specific manner following a general 'induced-fit' principle. Our work helps understanding the versatility and complexity of cargo recognition mediated by KLCTPR domains that depends on their unanticipated remarkable plasticity. We propose a model to explain why W-acidic and Y-acidic motifs that bind to the concave groove of KLCTPR with similar low micromolar affinity exhibit different capacities to promote kinesin-1 activity. JIP1 is an important adaptor protein that can couple kinesin-1 to several cargoes thus enabling their transport along MTs (Figure 1B, left-hand side). While its JNK-binding domain (JBD) is required for interaction with JNK, its PTB domain binds several proteins, including APP, apolipoprotein E receptor 2 (ApoER2), p190RhoGEF, dual leucine zipper bearing kinase (DLK), and JIP3 (JSAP1). The short JIP1C-term stretch that binds to KLC1TPR is highly conserved and characterized by a low theoretical pI value of 4.57 due to the presence of multiple acidic amino acids (Figure 1C, top). The most C-terminal tyrosine (Y709 in human JIP1) is particularly important for the interaction and its replacement by an alanine has been shown to result in loss of KLC1 binding in immunoprecipitation experiments (Verhey et al., 2001). As Y709 is embedded within the acidic patch we refer to this region as the Y-acidic core (Figure 1C). To further validate this interaction, we employed an in vitro fluorescence polarization (FP) assay. We first measured the affinity between TAMRA-labelled JIP1C-term and the highly homologous KLC1TPR and KLC2TPR domains. We find that at 150 mM NaCl TAMRA-JIP1C-term binds to KLC1TPR with a KD of 0.95 μM whilst its affinity for KLC2TPR is significantly lower (KD >94 μM, Figure 1D) consistent with a previously reported specificity of JIP1C-term for KLC1TPR (Zhu et al., 2012). Moreover, like we observed for W-acidic peptides (Pernigo et al., 2013), binding affinity measurements at varying NaCl concentrations indicate that Y-acidic motifs rely on an electrostatic component for recognition. KD values for TAMRA-JIP1C-term:KLC1TPR binding are 0.48 μM and ~10 μM at NaCl concentrations of 85 and 500 mM, respectively (Figure 1—figure supplement 1). A control isothermal titration calorimetry (ITC) experiment carried out using unlabeled JIP1C-term indicates that the TAMRA label does not interfere with the interaction (Figure 1—figure supplement 2). Another protein that has also been shown to bind to KLC1 in co-IP experiments is TorsinA, a constitutively inactive AAA+ (ATPases associated with a variety of cellular activities) protein whose gene is linked to early-onset dystonia type 1 (DYT1) (Kamm et al., 2004) (Figure 1B, right-hand side). As gene deletions revealed that its last ~80 amino acids are sufficient for the interaction (Kamm et al., 2004), we inspected the primary structure of this region and noticed that its C-terminus shares similarities with JIP1C-term, particularly, with respect to the conservation of a Y-acidic core (Figure 1C, bottom). We thus hypothesised that this region might be responsible for KLC1 binding. Similarly to JIP1, we find that a TAMRA-labeled peptide encompassing the last 12 amino acids of mouse TorsinA (TAMRA-TorsinAC-term) binds at 150 mM NaCl with KD values of 1.7 μM and >24 μM to KLC1TPR and KLC2TPR, respectively (Figure 1E), and that affinity for KLC1TPR depends on the ionic strength of the medium with KD values of 1.2 μM and ~30 μM at NaCl concentrations of 85 and 500 mM, respectively (Figure 1—figure supplement 1). Overall, Y-acidic motifs bind to KLC1TPR with low micromolar affinity at physiological ionic strength and may provide a common mechanism for distinguishing between isoforms with preference for KLC1 over KLC2. To elucidate how the well-established JIP1 cargo adaptor is recognized by KLC1TPR we pursued a crystallographic approach. We were previously successful in obtaining diffracting crystals of KLC2TPR in complex with the cognate SKIPWD W-acidic peptide by engineering a chimeric construct in which the peptide was fused N-terminal to KLC2TPR via a flexible (TGS)4 linker (Pernigo et al., 2013). Here, we used a similar approach. However, as JIP1 binds to KLC1TPR using its C-terminus we hypothesized that a free carboxyl group might be important for the interaction. We therefore fused JIP1C-term downstream of KLC1TPR via a flexible (TGS)10 linker. Crystals of the chimera grew readily in a variety of conditions. However, they exhibited very limited diffraction (worse than 15 Å resolution) or, more often, no diffraction at all. To improve crystal quality, we decided to employ Nanobodies (Nbs) as crystallization chaperones (Pardon et al., 2014). Using the chimera as an antigen, a pool of 29 high-affinity Nbs was generated and a subset later employed in crystallization trials following purification of each individual Nb:chimera complex. Nb-mediated crystallization dramatically improved crystal quality and allowed us to collect X-ray data for the complex to 2.7 Å resolution using synchrotron radiation. We also sought to obtain structural information on TorsinA binding. To this end, we replaced the JIP1C-term sequence with that of TorsinAC-term and produced crystals that diffracted X-rays at 2.3 Å resolution. A summary of data collection statistics is given in Table 1. X-ray data collection and refinement statistics. *Numbers in parentheses refer to the highest resolution bin. KLC1TPR consists of six TPR repeats (TPR1 to TPR6), each contributed by a classical helix-turn-helix structural motif arranged in a right-handed super-helical conformation, with an additional non-TPR helix (αN) positioned between TPR5 and TPR6. The structures of the complexes reveal that the C-terminal peptides bind in an extended conformation straddling across the KLC1TPR concave surface with a direction opposite to that of super-helical coiling (Figure 2). The epitope recognized by the Nb used as crystallization chaperone is totally distinct from the peptide-binding region and maps on the outer surface with contributions from residues on TPR4(α8) and TPR5. The KLC1TPR domain is typically very well defined in both structures. However, most of the stretch connecting the single non-TPR αN helix to α11 of TPR6 (residues 437 – 459) could not be modeled due to flexibility. Also, electron density for helix α1 of TPR1 is of significantly poorer quality compared to all other TPR helices indicating that this region is more disordered (Figure 2—figure supplement 1). Indeed, this helix appears to display an unusual degree of plasticity (Nguyen et al., 2017). For JIP1C-term, electron density is observed for the last eight residues of the 11-aa long peptide (Figure 2A,B) whilst for TorsinAC-term we could model all but the first residue of the 12-aa long peptide (Figure 2C,D). The engineered (TGS)10 linker connecting the TPR domain to the Y-acidic cargo adaptor peptides is not visible in electron density maps suggesting that this region is flexible and does not interfere with binding. Overall structure of the complexes and conformational transition upon Y-acidic peptide recognition. (A,B) KLC1TPR-JIP1C-term. Illustrated representations of the JIP1C-term peptide (displayed as a magenta stick model accompanied by its 2mFo-DFc electron density in green contoured at the 1.1σ level) bound to the KLC1TPR domain (gold) in two orthogonal views. The Nanobody (Nb) is shown in light grey. Helices α1 to α12 of the six TPR helix-turn-helix motifs and the non-TPR helix αN located between TPR5 and TPR6 are labeled. The flexible region between αN and α12 is indicated with a broken line while the unmodeled engineered linker connecting α12 to the JIP1C-term is not shown for clarity. Color-coded N and C labels indicate the N- and C-termini, respectively. Noncarbon elements are nitrogen and oxygen in dark blue and red, respectively. (C,D) KLC1TPR-TorsinAC-term. As (A,B) for the TorsinAC-term peptide colored in violet. (E,F) Conformational transition in the KLC1TPR domain upon recognition of Y-acidic peptides. Superposition of ligand-free KLC1TPR (PDB code 3NF1) and KLC1TPR-JIP1C-term (E) or KLC1TPR-TorsinAC-term (F) performed using the DynDom algorithm (Poornam et al., 2009). The analysis reveals the presence of an N-terminal 'moving' domain (highlighted in dark grey and gold for KLC1TPR and the KLC1TPR-Y-acidic complexes, respectively) and a C-terminal fixed domain (in light grey) with 'bending residues' shown in blue. The conformational transition requires a rotation of ∼30° degrees around the hinge axis represented by a blue arrow. Hinge residues are also highlighted in blue. 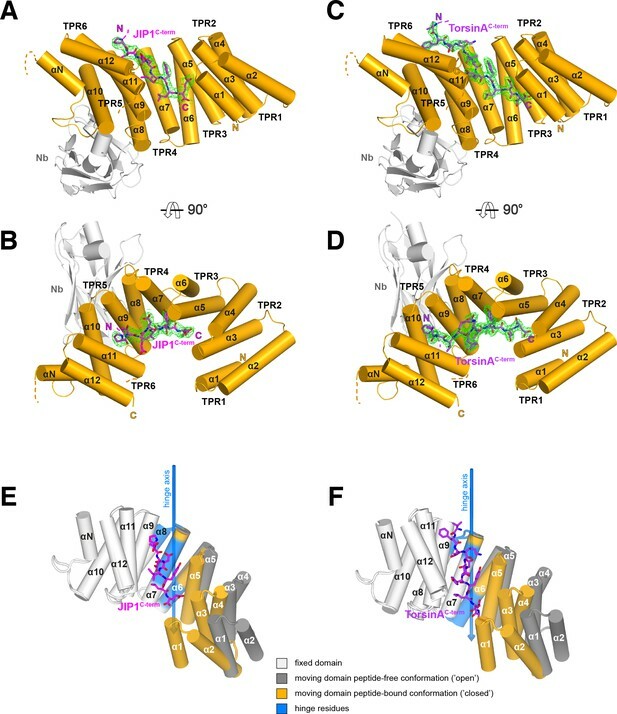 A comparison between the structures of KLC1TPR in the unbound (Zhu et al., 2012) and Y-acidic peptide-loaded states reveals dramatic conformational differences whereby peptide recognition induces an 'open'-to-'closed' transition in its solenoid structure (Figure 2E,F) (Figure 2-Video 1). While the KLC1TPR domains are essentially identical in both Y-acidic peptide-bound structures (rmsd = 0.75 Å over 259 equivalent Cα atoms), a similar global superposition between the peptide-free ('open', PDB code 3NF1) and the TorsinAC-term-bound ('closed') structures gives a rmsd of ∼4.1 Å for 253 equivalent Cα atoms. An analysis using the DynDom algorithm (Poornam et al., 2009) indicates that peptide recognition elicits a conformational transition that is best described by a ∼30° rotation of an N-terminal domain with respect to a hinge region largely contributed by residues belonging to second-half and first-half of TPR3(α6) and TPR4(α8) (residues 323 – 329, 348 – 350, 353 – 358), respectively, while the C-terminal region (second-half of α8 to α12) is fixed. As a result, the TPR1(α1) helix axis undergoes a lateral displaced of over 16 Å. Each individual domain behaves essentially as a rigid unit (rmsd N-terminal moving domains = 1.06 Å over 117 equivalent Cα atoms, rmsd C-terminal fixed domains = 0.88 Å over 131 equivalent Cα atoms). Overall, this highlights a significant degree of plasticity of the KLC1TPR domain that is used to accommodate the Y-acidic peptides by an 'induced fit' mechanism. KLC1TPR conformational transition upon TorsinAC-term binding. JIP1C-term and TorsinAC-term peptides are recognized by their KLC1TPR receptor using a common binding mode. An analysis performed with the Protein Interfaces, Surfaces and Assemblies (PISA) algorithm (Krissinel and Henrick, 2007) indicates that ~75% of the surface atoms of the bound peptides form an extensive interface that is stabilized by residues contributed by the first helices of TPR2-6 (α3, α5, α7, α9, α11) whilst fewer residues on α4, α6, α8, α10 make secondary contacts (Figure 3A). Overall, the interface area is ~710 Å2 and ~887 Å2 for the KLC1TPR-JIP1C-term and KLC1TPR-TorsinAC-term complexes, respectively. The larger surface area for the latter complex reflects the longer TorsinA peptide bound to KLC1TPR. As JIP1 is one of the most important and extensively validated cargo adaptors we will discuss general principles for Y-acidic peptide binding using the KLC1TPR-JIP1C-term complex as a reference. Molecular interface and cellular validation. (A) Interface contact map for the KLC1TPR-JIP1C-term/TorsinAC-term complexes. The sequence of KLC2TPR is also shown for comparison. Colored circles indicate residues at the interface as indicated in the inset. Their radius is proportional to the buried area. The letter codes H and S highlight residues involved in hydrogen bonds and salt bridges, respectively. The black arrows highlight the only two residues making significant contacts with the Y-acidic peptides that are not conserved in KLC2TPR. Numbers are for KLC1TPR. (B) Sliced-surface view of the KLC1TPR domain with bound JIP1C-term. The molecular surface is colored according to its electrostatic potential. Positive and negative potential in the +10kBT/e to −10kBT/e range is shown in blue and red, respectively. (C) Details of the KLC1TPR-JIP1C-terminterface. The amino acids involved in the interactions are shown as stick models with oxygen atoms colored in red, nitrogen in blue and carbon in gold and magenta for KLC1TPR and JIP1C-term, respectively. Hydrogen bonds and salt bridges are represented by dotted grey and magenta lines, respectively. Residues tested for cellular validation (see panel D) are boxed. (D) Western blot analysis of coimmunoprecipitation assays showing the effect of selected KLC1TPR mutations on the interaction with JIP1. (E) Quantification of relative binding from two independent coimmunoprecipitation experiments. Error bars show SEM. All selected mutations reduce binding between ~65% and 90% compared to wild-type (WT) and are statistically significant to p<0.001. Statistical analysis was performed with the GraphPad Prism package using ordinary one-way ANOVA for multiple comparisons. (F) FP measurements show that the KLC2TPR S328,454N variant binds JIP1C-term with an affinity comparable to KLC1TPR with the S328N substitution playing a dominant role in restoring KLC1TPR-like affinity. Residues S328 and S454 of KLC2 correspond to residues N343 and N469 of KLC1TPR, respectively. Binding curves for KLC1TPR and KLC2TPR are also shown for comparison. The structure shows that the recognition peptide binds in an extended conformation to the positively charged inner surface of the TPR solenoid structure (Figure 3B) with the conserved tyrosine within the Y-acidic core (Y709, referred to as position 0, p0) hosted by a 'made-to-measure' cavity (highlighted by a white dotted line in Figure 3B). The cavity stabilizing the side-chain of (p0)Y709, located between TPR3(α5/α6) and TPR4(α7), is lined by V305, K309, Y313, N344, L347, L348, N351 with the amide group of the latter residue participating in a H-bond with (p−2)D707(Oδ2) (Figure 3C). Two asparagine pairs (N386/N343 and N301/N344) also engage in hydrogen bonds the main chain atoms of (p−1)I708 and (p+1)L710, respectively, while the C-terminal glutamate (E711) at position (p+2) is locked in place by salt bridges with residues R266 and K340 that interact with its side-chain and main-chain carboxylate groups, respectively. The latter interaction is critically important as FP measurement using a C-terminally amidated version of the TAMRA-JIP1C-term peptide (TAMRA-JIP1amidated C-term) shows complete abrogation of KLC1TPR binding (Figure 3—figure supplement 1). 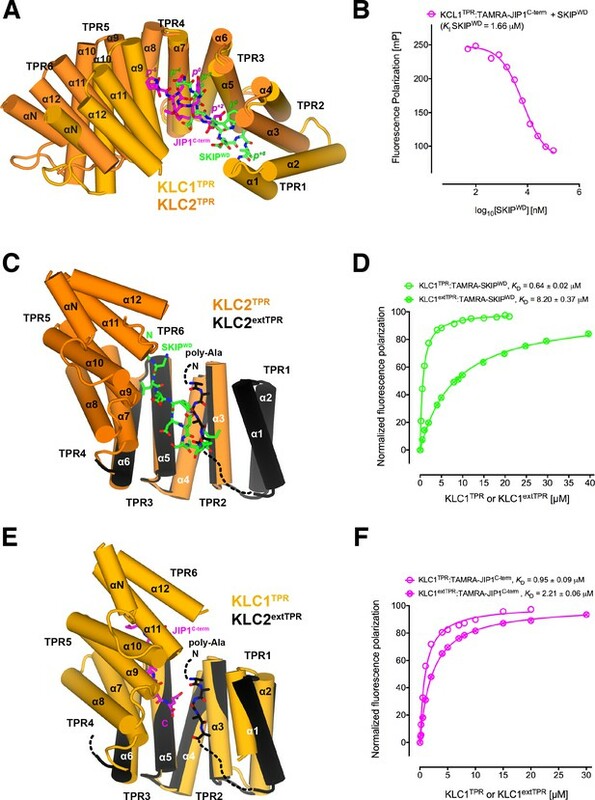 Virtually all key interactions observed in the KLC1TPR-JIP1C-term structure also stabilize the bound TorsinAC-term peptide (Figure 3—figure supplement 2). The additional amino acid at the p+3 position present in TorsinAC-term is hosted by a cavity (highlighted by a cyan dotted line in Figure 3B) lined partly by yet another asparagine pair (N259/N302) that together with the side-chains of R327 and K340 stabilize the C-terminal aspartate residue (Figure 3—figure supplement 2). As TorsinAC-term binds to KLC1TPR with comparable affinity this indicates that the loss of the free carboxylate at position p+2 is largely compensated by the gain of the additional C-terminal acidic residue at p+3. While JIP1C-term and TorsinAC-term peptides display a virtually identical main-chain trace for their Y-acidic core, conformational variability is observed for their N-terminal portion that is not conserved (Figure 3—figure supplement 3). Overall, a combination of electrostatics, specific interactions often mediated by receptor asparagine residues, and the intrinsically malleable nature of the cargo adaptor peptides, plays a main role in the recognition process. To further validate the KLC1TPR-JIP1C-term interface and to rationalize the strong preference of this cargo adaptor for KLC1TPR over the highly homologous KLC2TPR observed in FP measurements, we employed immunoprecipitation in HeLa cells in combination with structure-guided mutagenesis. Cells were co-transfected with wild-type and mutant constructs expressing hemagglutinin (HA)–KLC1TPR and FLAG-JIP1 (Figure 3D). For mutagenesis, key KLC1TPR interface residues R266, N343, N386, N469 were substituted with a serine to alter their salt bridge/H-bonding capabilities while V305 was replaced with a threonine to generate an isosteric change with altered polarity. We also mutagenized residues not at the interface as negative controls (Q222A, E484A, E488A) Overall, we find that all amino acid substitutions at the interface, but not negative controls (Figure 3—figure supplement 4), substantially reduce the affinity between KLC1TPR and JIP1 with residual binding quantified ranging from ∼15% to ∼35% compared to wild-type (Figure 3E). In particular, a very strong effect is observed for the R266S replacement that prevents the formation of a salt bridge with the (p+2) acidic side-chain and a similar near-abrogation of binding is engendered by an increase in polarity (V305T) within the receptor cavity surface that interacts 'face-on' with the aromatic ring of (p0) tyrosine (Figure 3C). The N343S and N469S substitutions are particularly informative with respect to the specificity of Y-acidic peptides for the KLC1 isoform over KLC2. A sequence comparison between KLC1TPR and KLC2TPR highlights that the only two interface residues that differ between these isoform domains are KLC1 N343 and N469. These are naturally present as serine residues (S328 and S454, respectively) in KLC2 (highlighted by arrows in Figure 3A). The structure shows that asparagines at these topological positions play a key role in maintaining the stability of the complex via H-bond interactions at positions p−5 and p−1 of the main chain cargo peptide. Our co-IP experiment shows that a substitution at either of these positions by a serine, thus imparting KLC2TPR-like properties, negatively affects the stability of the complex. To further probe the role of these residues in KLC1 specificity, we have generated KLC2TPR S328N, KLC2TPR S454N, and KLC2TPR S328,454N variants and used them in FP measurements to determine their affinity for TAMRA-JIP1C-term (Figure 3F). We find that both individual substitutions increase the affinity for the JIP1C-term peptide with S328N playing a main role (~37 fold increase in activity compared to KLC2TPR). Importantly, the KLC2TPR S328,454N double variant binds TAMRA-JIP1C-term with an affinity comparable to KLC1TPR (KD = 1.29 μM) and the same is true for TAMRA-TorsinAC-term binding (Figure 3—figure supplement 5). Therefore, residues N343 and N469 are entirely responsible for the specificity of Y-acidic motif for KLC1. We have previously solved the X-ray structure of KLC2TPR in complex with the SKIPWD W-acidic peptide, thus providing a structural basis for the recognition of this widespread adaptor motif (Pernigo et al., 2013). A comparative analysis with the structures presented here reveals that Y-acidic and W-acidic motifs are recognized by partly overlapping binding sites that are shifted with respect to each other along the inner channel generated by the TPR right-handed super-helical arrangement (Figure 4A). The W-acidic motif binds toward the N-terminal end of the channel with its critical tryptophan residue sandwiched between TPR2 and TPR3 while the Y-acidic motif is positioned more C-terminally with its key tyrosine residue stabilized by the interface between TPR3 and TPR4 approximately at the same location occupied by the SKIPWD leucine at (p−2). Although W-acidic binding also occurs by an 'induced fit' mechanism, it elicits a more restrained closure of the receptor compared to Y-acidic binding, defined by smaller rotation (∼20.0˚) with respect to an alternative, more N-terminal, hinge axis (Figure 4—figure supplement 1). Despite these differences, W-acidic and Y-acidic binding sites partly overlap and in agreement with this we find that an unlabeled SKIPWD peptide is able to specifically compete TAMRA-JIP1C-term binding in a concentration-dependent manner in our FP assay (Figure 4B). The functional implication of this is that a single KLC1TPR is not expected to simultaneously engage both types of cargo adaptors. The partial separation of Y-acidic and W-acidic binding sites on KLCTPR has also a possible important functional consequence. We have solved previously the 4 Å-resolution structure of KLC2extTPR, an extended TPR featuring the conserved LFP-acidic region N-terminal to the KLCTPR domain that contributes to kinesin-1 inhibition (Figure 1A) (Yip et al., 2016). In this structure the KLC2TPR domain is in its 'open' (ligand-free) conformation and we could model a stretch five poly-Ala residues between helices α1, α3, α5 that likely defines the general location of the intramolecular LFP-acidic region. The poly-Ala peptide partly overlaps with the SKIPWD binding site (Figure 4C) and consistent with this we found that a TAMRA-SKIPWD peptide binds in an FP assay with lower affinity to KLC2extTPR compared to KLC2TPR due to the inhibitory effect of the intramolecular LFP-acidic stretch (Yip et al., 2016). We have now also measured the affinity of TAMRA-SKIPWD for KLC1extTPR and KLC1TPR and, like for KLC2, the presence of the LFP-acidic region significantly inhibits binding, in this case, by more than one order of magnitude (KD from 0.64 ± 0.02 μM to 8.20 ± 0.37 µM, Figure 4D). In contrast, TAMRA-JIP1C-term binds with a similar affinity to either KLC1extTPR (KD = 2.21 ± 0.06 μM) or KLC1TPR (KD = 0.95 ± 0.09 μM) (Figure 4F) (Yip et al., 2016). A structural superposition between KLC1TPR-JIP1C-term and KLC2extTPR allows to rationalize the minimal impact that the LFP-acidic extension has on JIP1C-term binding. We observe that the KLC1TPR N-terminal domain rotation elicited by JIP1C-term binding is compatible with the presence of the poly-Ala peptide as no clashes are observed (Figure 4E). This is largely due to the more advanced position along the inner KLCTPR cavity of this adaptor peptide compared to SKIPWD. Thus, although with the obvious limitation imposed by a poly-Ala model that does not allow to reveal the full range of possible intermolecular interactions, we suggest that while an intramolecular interaction with the LFP-acidic region is not compatible with SKIPWD binding, this might be of little or no interference with JIP1C-term loading. This is in agreement with FP data (Figure 4F). Y-acidic and W-acidic motifs bind at partly overlapping sites on KLCTPR and are differentially affected by the presence of the LFP-acidic intramolecular region. (A) Superposition of the KLC1TPR-JIP1C-term and KLC2TPR-SKIPWD (Pernigo et al., 2013) complexes. JIP1C-term and SKIPWD are shown as stick representation and colored in magenta and green, respectively. Selected amino acid positions are labeled using the Y-acidic tyrosine and the W-acidic tryptophan as references (position 0, p0). KLC1TPR and KLC2TPR are colored in gold and orange, respectively. TPR1 is missing in the KLC2TPR-SKIPWD structure. The positions of the Y-acidic JIP1C-term and W-acidic SKIPWD peptides are shifted along the inner cavity of the super-helical KLCTPR architecture and binding at these alternative locations induces a different degree of conformational change in the receptor. (B) Titration of increasing amounts of unlabeled SKIPWD in the KLC1TPR:JIP1C-term complex shows a decreased FP signal that supports competitive displacement owing to their overlapping binding sites. (C) Superposition of the KLC2TPR-SKIPWD (Pernigo et al., 2013) and KLC2extTPR (Yip et al., 2016) structures (view is rotated by ∼90° around the x axis compared to A). For clarity, only the first three TPRs of KLC2extTPR (in black) that define the local environment of the LFP-acidic (also in black, modelled as poly-Ala) are shown. SKIPWD and LFP-acidic peptides bind at overlapping positions. (D) FP measurements show that the N-terminal extension of KLC1TPR domain that includes the LFP-acidic region (KLC1extTPR) inhibits the interaction with TAMRA-SKIPWD compared with KLC1TPR alone. (E) Superposition of the KLC1TPR-JIP1C-term and KLC2extTPR (Yip et al., 2016) structures (same orientation as C). As in (C) only the first three TPRs of KLC2extTPR are shown in black. JIP1C-term (in magenta) and LFP-acidic (in black) peptides bind at largely independent positions. (F) FP measurements show that the LFP-acidic N-terminal extension to KLC1TPR has only a modest impact on TAMRA-JIP1C-term binding (Yip et al., 2016). This panel is re-produced under the following license agreement: http://www.pnas.org/sites/default/files/advanced-pages/authorlicense.pdf. It is not available under CC-BY and is exempt from the CC-BY 4.0 license. In mammals, the JIP family of adaptor proteins is composed of four members with JIP1 and JIP2 sharing a similar domain organization that is different from that of JIP3/JIP4 (Whitmarsh, 2006). At their N-terminal region, both JIP3/4 are composed of leucine zipper segments, the second of which (JIP3LZ2), has also been found to mediate interaction with KLC1TPR (Bowman et al., 2000; Kelkar et al., 2005; Nguyen et al., 2005). Functionally, various studies have shown that JIP1 and JIP3 cooperate for kinesin-1-mediated transport (Hammond et al., 2008; Satake et al., 2013; Sun et al., 2017). To investigate this cooperative effect in the context of our study, we performed co-immunoprecipitation studies (Figure 5A). We find that while JIP1 interacts effectively with KLC1TPR in isolation this is not the case for JIP3, suggesting that the JIP3LZ2-KLC1TPR interaction is weaker. However, co-expression of both adaptor proteins significantly enhances their association in keeping with a co-operative behavior. Moreover, JIP1C-term anchoring to KLC1TPR is critically important for the assembly of the ternary complex as inhibition of JIP1 binding to KLC1TPR by the R266S mutation, significantly reduced JIP3 association. These results are quantified in Figure 5B,C. (A) Western blot analysis of coimmunoprecipitation assays showing co-operative formation of the JIP1 and JIP3 complex. The effect of the KLC1TPR R266S mutations on the formation of the complex is also shown. (B, C) Quantification of relative JIP1 binding (B) and JIP3 binding (C) from three independent co-immunoprecipitation experiments (normalized to the sample indicated by a black bar). Error bars show SEM. Statistical analysis was performed with the GraphPad Prism package using ordinary one-way ANOVA for multiple comparisons, *p<0.05, ***p<0.001. (D, E, F) Binding of GST-JIP3LZ2 to His6-KLC1extTPR (D), His6-KLC1extTPR-JIP1C-term (E), His6-KLC1TPR-JIP1C-term (F) measured by ITC. It shows that JIP3LZ2 affinity for the TPR domain is not affected by either the LFP-acidic region or JIP1C-term loading. All experiments were carried out in 50 mM HEPES, 500 mM NaCl, 5 mM 2-mercaptoethanol at T = 20°C. In (D) the volume of the first six injections following the initial sacrificial one was 1.0 μl and the rest were 2.0 μl. In (E) and (F) all working injections were 1.5 μl. All injections were performed at 150 s time intervals. As JIP1C-term binding alters the conformation of KLC1TPR, we sought to explore whether this affects binding of JIP3LZ2 to KLC1TPR using ITC measurements (Table 2). Binding of GST-JIP3LZ2 to His6-KLC1extTPR is an enthalpy-driven process with a dissociation constant KD of ~3.5 μM in which two TPR domains bind to a JIP3LZ2 coiled-coil dimer (Figure 5D). This stoichiometry is consistent with the recently published crystallographic analysis of the KLC2TPR-JIP3LZ2 complex that shows two TPR domains symmetrically bound to the JIP3LZ2 coiled-coil (Cockburn et al., 2018) and also native mass spectrometry (MS) analysis (Figure 5—figure supplement 1). No significant changes in KD are observed when His6-KLC1extTPR is replaced by either His6-KLC1extTPR-JIP1C-term (Figure 5E) or His6-KLC1TPR-JIP1C-term (Figure 5F) thus indicating that the binding of JIP3LZ2 to KLC1TPR is independent of either JIP1C-term and of the conformational change it elicits or the LFP-acidic region. Taken together, these data support the notion that JIP1 and JIP3 act co-operatively to recruit kinesin-1 and that this requires KLC1TPR binding to JIP1C-term. However, key interactions mediating this effect lie outside of the direct KLCTPR domain interfaces. For many cargo types, anchoring to the kinesin-1 motor is not direct but mediated by adaptor or scaffolding proteins that provide a molecular and mechanistic link for kinesin-driven intracellular transport (Fu and Holzbaur, 2014). An important region on the regulatory light chains that is often engaged by adaptors is their KLCTPR domain. TPR domains are found in a wide range of proteins and represent common platforms for protein-protein interactions (D'Andrea and Regan, 2003; Zeytuni and Zarivach, 2012). Like some other repeat-containing proteins, such as leucine-rich-repeats and WD40s, TPR domains have been traditionally considered fairly rigid docking platforms that respond with limited conformational alterations to ligand binding, thus lending support to the view that they are essentially pre-organized architectures onto which specific ligand-binding residues are 'grafted' (Cortajarena and Regan, 2006). Such a static view has been more recently mitigated by examples of TPR domains that undergo some conformational changes in response to protein-protein interactions. For example, a reduction of the solenoid super-helical pitch has been observed in the TPR domain of the Pex5p receptor in response to loading the peroxisomal targeting signal type 1 (PTS1) (Stanley et al., 2006). Also, in the magnetosome-associated protein, MamA the N-terminal portion of its TPR domain undergoes a radial movement of ∼3° upon binding of a putative ligand imitator (Zeytuni et al., 2011). Our crystallographic analysis of the recognition mechanism of Y-acidic motifs by KLC1TPR that extends our previous work on the recognition of W-acidic motifs (Pernigo et al., 2013), strongly challenges the view of TPR motifs as rigid scaffolds. Instead, it portrays their strongly adaptive nature as binding of these motifs involves rotations of the N-terminal portion of the molecule of up to ∼30° with respect to alternative hinge axes. Overall, KLCTPR domains display the remarkable ability to employ inter-TPR repeats as separate 'compartments' to stabilize different peptide types in an isoform-specific manner. While JIP1 is one of the best-established and most studied adaptors, the role for TorsinA in the context of kinesin-1-based transport is less clear. TorsinA, the founding member of the Torsin family, is a constitutively inactive AAA+ protein of medical importance as a three-base pair (ΔGAG) deletion that removes one of a pair of glutamic acid residues (Glu-302/303) in proximity of its C-terminus is linked to DYT1, a neurological disorder that leads to uncontrollable muscular movements (Ozelius et al., 1997). In cells, TorsinA is predominantly localized in the lumen of the endoplasmic reticulum (ER) or nuclear envelope (NE) where its ATPase enzymatic activity requires the stimulation by one of two transmembrane cofactors, LAP1 (lamina associated polypeptide 1) or LULL1 (luminal domain like LAP1), via their luminal domains (Zhao et al., 2013). However, the exact biological function of TorsinA and other family members is at present uncertain although they clearly play a role in the integrity of the NE (Laudermilch and Schlieker, 2016). Interestingly, wild-type TorsinA expressed in brain CAD cells has been found co-localized with endogenous KLC1TPR at the distal end of processes, whereas mutant TorsinAΔGAG remained confined to the cell body thus opening the possibility that the wild-type protein undergoes anterograde transport along MTs possibly acting as a molecular chaperone regulating kinesin-1 activity and/or cargo binding (Kamm et al., 2004). This intriguing function would imply the existence of an endogenous TorsinA cytosolic pool that might be available to interact with kinesin-1. Indeed, the literature suggests that oxidative or heat-shock stresses can induce TorsinA translocation from the ER to the cytosol (Adam et al., 2017; Hewett et al., 2003). Our structural study shows that the C-terminus of TorsinA binds, like JIP1, preferentially to KLC1TPR with a similar low micromolar dissociation constant. In addition to the interaction with the Y-acidic core, KLC1TPR appears also perfectly poised to stabilize the additional negatively charged residue at position p+3 as well as the more divergent peptide region N-terminal of the Y-acidic core. These interactions define a rather robust molecular interface that, on the basis of structural considerations, warrants a deeper analysis of a possible functional role of TorsinA as a kinesin-1 adaptor/cargo. 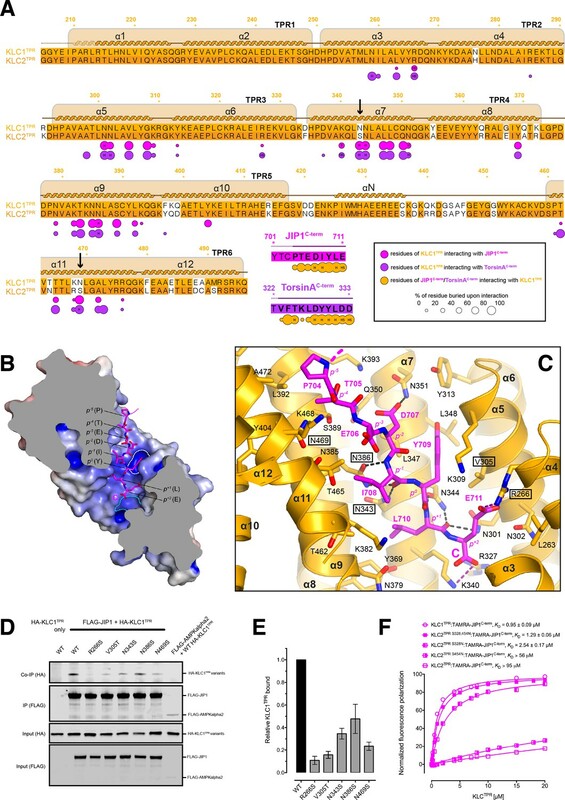 Interestingly, a comparison of the KLC1TPR-TorsinAC-term structure with that of the recently solved complex between the TorsinAAA+ domain and its LULL1 activator reveals that the TorsinAC-term region can undergo a dramatic structural transition. The TorsinAC-term segment that is part of the TorsinAAA+ domain folds into a α-helix in the complex with LULL1 playing a role in its stabilization (Demircioglu et al., 2016). On the other hand, TorsinAC-term assumes a completely extended conformation when in complex with KLC1TPR. This change in secondary structure is reminiscent of that undergone by the C-terminal domain (CTD) of the tubulin-like FtsZ upon binding to different regulatory proteins where the CTD folds into a α-helix when bound to the E. coli FtsZ-binding domain of ZipA and Thermotoga maritima FtsA (Mosyak et al., 2000; Szwedziak et al., 2012) while it takes an extended conformation when bound to SlmA from E. coli, Vibrio cholera, and Klebsiella pneumonia (Schumacher and Zeng, 2016). This plasticity has been suggested to be important for the versatile recognition of different regulators (Schumacher and Zeng, 2016). Similarly, it could be a mechanism utilized by TorsinA to select different partners, in this case, in alternative subcellular locations. The role of cargo adaptors in kinesin-1 motor activation is a complex and an incompletely understood one. Remarkably, adaptors featuring W-acidic motifs appear to encode both motor recognition (via KLCTPR binding) and activation capacities. For example, an artificial transmembrane protein containing either of the two cytosolic W-acidic motifs of calsyntenin was shown to induce kinesin-1’s vesicular association and anterograde transport in a KLC-dependent manner (Kawano et al., 2012). Moreover, these motifs can also functionally substitute for homologous regions within the vaccinia virus KLC binding protein A36 and activate transport (Dodding et al., 2011) or when fused to LAMP1, promote lysosome transport (Pu et al., 2015). Differently, while the C-terminal Y-acidic region of JIP1 is sufficient to recruit KLC1 to vesicles, it is not able to activate transport (Kawano et al., 2012). Indeed, JIP1 requires interactions with the coiled-coil region of KHC and the KHC-tail binding protein FEZ1, or JIP3, a separate member of the JIP family, for full activity (Blasius et al., 2007; Fu and Holzbaur, 2014; Hammond et al., 2008; Satake et al., 2013). Recently, a clear cooperative role of JIP1 and JIP3 has been identified for the anterograde axonal transport of TrkB receptors (Sun et al., 2017), further supporting previous results that indicated that JIP1 and JIP3 are co-transported in neuronal cells (Hammond et al., 2008). The structural results presented here in conjunction with our previous studies allow us to formulate some hypotheses as to why Y-acidic and W-acidic motifs induce different functional responses. Our previous work has demonstrated that binding of W-acidic motifs displaces an intramolecular interaction between the KLCTPR and the LFP-acidic region (Yip et al., 2016). Moreover, binding of W-acidic motifs or disruption of the LFP-acidic intramolecular interaction triggers global changes in the KLC conformation, promotes kinesin-1 activity and results in an additional binding site on KHC-tail becoming accessible (Sanger et al., 2017; Yip et al., 2016). A key piece of data supporting this model is the observation that inclusion of the inhibitory LFP-containing sequence on KLC1/2TPR substantially reduces its affinity for W-acidic peptides. On the other hand, inclusion of the LFP-acidic sequence has very little effect on KLC1TPR affinity for the JIP1C-term Y-acidic peptide. This suggests that Y-acidic binding might co-exist with LFP-acidic binding and therefore cannot alone initiate this activation pathway. Two possibilities then present themselves – firstly, cooperative interactions with JIP3 serve to displace the LFP-acidic linker, driving the same activation pathway. 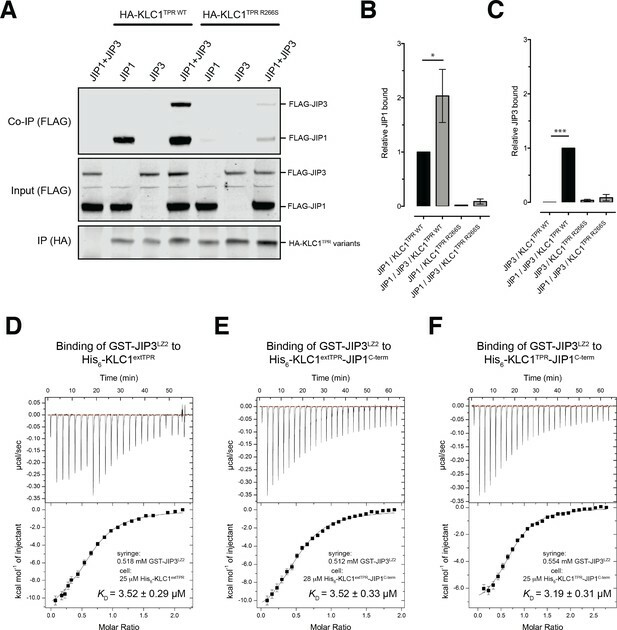 Alternatively, the LFP-acidic linker remains bound and there is an as yet uncharacterized activation pathway triggered by JIP1/JIP3 binding that is more reliant on the additional direct adaptor interactions with KHC. Our ITC and mass spectrometry data suggest the possibility that could be driven by steric effects resulting from the JIP3LZ2-mediated dimerization of KLC1TPR within the kinesin-1 tetramer, a notion further substantiated by the recent publication of a KLC2TPR-JIP3LZ2 structure that shows two TPR domains (in their ‘open’ conformation) symmetrically bound to the JIP3LZ2 coiled-coil (Cockburn et al., 2018). However, our data strongly argue that a functional JIP1-JIP3 transport complex would have its TPR domains in their closed conformation induced by Y-acidic binding. Structural insight into ternary KLC1-JIP1-JIP3 complexes and the tetrameric kinesin-1 tail region will be required to fully address the question of co-operativity in kinesin-1-mediated transport. Codon-optimized DNA sequences encoding the TPR domain of mouse KLC1 (residues 205 – 496, Uniprot Q5UE59, KLC1TPR) fused either to the C-terminal 11 amino acids of human JIP1 (residues 701 – 711, Uniprot Q9UQF2, JIP1C-term) or the C-terminal 12 amino acids of mouse TorsinA (residues 322 – 333, Uniprot Q9ER39, TorsinAC-term) linked via a (Thr-Gly-Ser)5 or 10 flexible connector were purchased from Genscript and subcloned between the NdeI/XhoI sites of a pET28 vector (Novagen). This strategy allows for the expression of chimeric proteins that will be identified as KLC1TPR-JIP1C-term and KLC1TPR-TorsinAC-term, respectively, bearing a thrombin-cleavable N-terminal hexa-histidine tag. Nanobodies were generated by the VIB Nanobody Service Facility of Vrije Universiteit Brussel (VUB) following the immunization of a llama with purified KLC1TPR-JIP1C-term according to published protocols. Out of a panel of 36 antigen-specific nanobodies supplied in a pMECS vector, we sub-cloned a subset representing the most divergent amino acidic sequences between the PstI/BstEII sites of a pHEN6c vector. This allowed the expression of C-terminally His6-tagged nanobodies in the periplasmic space of E. coli. The LZ2 region of mouse JIP3 corresponding to residues (416-485) was expressed as Prescission-cleavable GST-fusion. FLAG-tagged JIP1 and JIP3 for expression in mammalian cells were obtained from Addgene as clones 52123 and 53458, respectively. Chimeric proteins were expressed in the E.coli BL21(DE3) strain. Briefly, single colonies were picked and grown at 21°C overnight. Small-scale overnight bacterial cultures were used to inoculate 8 × 0.5L cultures that were incubated at 37°C until they reached an OD600 of 0.4 – 0.6. The temperature was then lowered to 18°C and protein synthesis was induced by the addition of 500 µM isopropyl b-D-1-thiogalactopyranoside (IPTG) for 16 hr. Cells were harvested by centrifugation at 5000 g for 15 min at 4°C and resuspended in 50 mM 4-(2-hydroxyethyl)−1-piperazineethanesulfonic acid (HEPES) buffer at pH 7.5, 500 mM NaCl, 5 mM β-mercaptoethanol supplemented with protease inhibitor cocktail (Roche) and 5 U/ml of Benzonase endonuclease (Merck). Cell lysis was accomplished by sonication. Insoluble material was sedimented by centrifugation at 16500 g for 1 hr at 4°C and the supernatant microfiltered using a 0.22 µm pore size filter prior to loading on a HisTrap column (GE Healthcare) pre-equilibrated with lysis buffer for immobilized metal affinity chromatography (IMAC). Proteins were eluted with an imidazole gradient and fractions containing the target protein collected and dialysed overnight at 4°C against imidazole-free lysis buffer. The purification tag was cleaved by incubating the dialysed sample for approximately 5 hr at room temperature in the presence of thrombin protease covalently bound to agarose beads (Thrombin CleanCleave Kit, Sigma). Beads were removed by filtration over a gravitational column and the eluate further microfiltered using 0.22 µm pore size filter prior to loading it on a HisTrap column (GE Healthcare) pre-equilibrated with lysis buffer. Untagged material present in the flow-through fraction was collected, concentrated, and further purified by size exclusion chromatography (SEC) on a 16⁄60 HiLoad Superdex 75 column (GE Healthcare) equilibrated with 25 mM HEPES, pH 7.5, 150 mM NaCl, and 5 mM β-mercaptoethanol. Nanobodies were expressed in E.coli WK6 cells. Protein expression in TB medium was induced by addition of 1 mM IPTG at an OD600 of 0.9 – 1.0, and cells were grown overnight at 28°C. The periplasm fraction was harvested by osmotic shock, and Nanobodies were purified by IMAC and SEC using a HiLoad Superdex 75 column (GE Healthcare). The Nb:KLC1TPR-JIP1C-term and Nb:KLC1TPR-TorsinAC-term complexes used for crystallization were obtained by mixing the individual components with a 1∶1 molar ratio and allowing incubation on ice for 30 min. The complexes were further purified by SEC on a 16⁄60 HiLoad Superdex 75 column (GE Healthcare). All crystallization experiments were performed using the vapor diffusion setup at 18°C and a 1:1 protein:precipitant ratio in 400 nl sitting drops dispensed with the aid of Mosquito crystallization robot (TTP LabTech). Crystals of the Nb:KLC1TPR-JIP1C-term complex grew from a protein solution concentrated at ~10 mg/ml in the presence of a non-buffered reservoir solution containing 0.04 M potassium phosphate monobasic, 16% polyethylene glycol (PEG) 8000 (w/v) and 20% glycerol (v/v). For Nb:KLC1TPR-TorsinAC-term, the complex was also concentrated at ~10 mg/ml and crystals were obtained in the presence of 0.1 M HEPES pH 7.5, 10% propan-2-ol (v/v), 20% PEG 4000 (w/v). For cryoprotection, the latter crystals were briefly transferred to a reservoir solution in which the propan-2-ol concentration was increased to 30% (v/v). Datasets at the 2.7 Å and 2.3 Å resolution were measured at the P14 beam line of Petra III (Hamburg, Germany) and at the I04 beam line of Diamond Light Source (Didcot, United Kingdom) for Nb:KLC1TPR-JIP1C-term and Nb:KLC1TPR-TorsinAC-term, respectively. Although the growth conditions are different both complexes crystallize in the monoclinic space group C2 and display similar cell dimensions (Table 1). Data were processed using the xia2 pipeline (Kabsch, 2010; Waterman et al., 2016; Winter et al., 2013) and the structures were solved by the molecular replacement (MR) technique using the software package Phaser (McCoy et al., 2007). Based on our previous experience with W-acidic binding (Pernigo et al., 2013), we anticipated a TPR domain closure upon Y-acidic peptide binding. Therefore, we carried out molecular replacement trials with the C-terminal portion of KLC1 bound to the Nb that we had solved previously at low resolution. Model building and crystallographic refinement was performed using COOT (Emsley and Cowtan, 2004) and BUSTER (Bricogne et al., 2017), respectively. A summary of data collection and refinement statistics are shown in Table 1. Structural images were prepared with PyMol (Schrödinger). Samples for ITC measurements were extensively dialyzed in buffer composed of 50 mM HEPES, pH 7.5, 500 mM NaCl, and 5 mM 2-mercaptoethanol. ITC experiments were conducted on a MicroCal ITC (MicroCal Inc.) instrument at a temperature of 20°C. GST-JIP3LZ2 (550 µM) was loaded in the syringe and used as titrant while either His6-KLC1extTPR, His6-KLC1TPR-JIP1C-term or His6-KLC1extTPR-JIP1C-term were loaded in the cell and employed as analytes at the final concentration of 25 µM. Data were corrected for heats of dilution of the protein solution. Binding constants and other thermodynamic parameters were calculated by fitting the integrated titration data assuming a single set of binding sites using the Origin software package (OriginLab). N-terminal TAMRA-conjugated peptides and non-conjugated peptides used for FP and competition measurements were supplied either by Bio-Synthesis (Lewisville, TX) or by Pepceuticals Ltd. (Enderby Leicestershire, UK). Sequences were as follows: JIP1C-term, YTCPTEDIYLE; TorsinAC-term TVFTKLDYYLDD; SKIPWD, STNLEWDDSAI. JIP1amidated C-term has the same sequence as JIP1C-term but features an amidated C-terminus. Measurements were performed on a BMG Labtech PolarStar Omega plate reader at 20°C by incubating 300 nM TAMRA-labeled peptides with the indicated protein at increasing concentrations in 25 mM HEPES, pH 7.5, 5 mM 2-mercaptoethanol, and NaCl in the concentration range 85 – 500 mM. Estimation of equilibrium dissociation constant (KD) values was performed assuming a one-site specific-binding model using the Prism package (GraphPad Software). For competition experiments, a mixture of TAMRA-JIP1C-term and KLC1TPR at 300 nM and 2 µM, respectively, was incubated with increasing concentrations of unlabeled SKIPWD peptide in 25 mM HEPES, pH 7.5, 150 mM NaCl, 5 mM 2-mercaptoethanol buffer supplemented by 5% (v/v) DMSO. The concentration-dependent decrease in FP signal was fitted to a sigmoidal equation to derive IC50. KI estimation was performed using the online tool (http://sw16.im.med.umich.edu/software/calc_ki/online tool) based on Nikolovska-Coleska et al., 2004). Data points are the mean of three replicates. The protein complex (25 μl) was buffer exchanged into 150 mM ammonium acetate, pH 7.5 using Micro Bio-Spin six columns (Bio-Rad, CA). The buffer exchanged sample was infused into the mass spectrometer, a Synapt G2Si qTOF (Waters, MA), using a 20:80 Au:Pd coated borosilicate capillary into a nanoflow electrospray source. The instrument was calibrated using a caesium iodide mixture. The mass spectrometer was run in positive mode with a capillary voltage of 1.2 – 2.0 kV, a sampling cone of 40 – 80 V and a source temperature of 45°C. Mass spectra were processed using MassLynx V4.1 (Waters, MA). Journal of Cell Science 122:4177–4185. The Journal of Cell Biology 176:11–17. Biochimica et Biophysica Acta (BBA) - Molecular Basis of Disease 1762:1094–1108. Trends in Biochemical Sciences 28:655–662. Journal of Cell Science 126:2319–2329. The Journal of Cell Biology 202:495–508. Trends in Cell Biology 24:564–574. Journal of Neuroscience Research 72:158–168. Nature Reviews Molecular Cell Biology 10:682–696. Journal of Biological Chemistry 279:19882–19892. Molecular and Cellular Biology 25:2733–2743. Molecular Biology of the Cell 17:3651–3663. Journal of Molecular Biology 372:774–797. Current Opinion in Cell Biology 40:1–7. Journal of Biological Chemistry 279:19201–19208. Trends in Cell Biology 12:585–591. The Journal of Neuroscience 21:6597–6607. The Journal of biological chemistry 281:3552–3559. Journal of Biological Chemistry 280:30185–30191. Proteins: Structure, Function, and Bioinformatics 76:201–212. Journal of Cell Science 130:1637–1651. Journal of Biological Chemistry 277:3767–3775. Cellular and Molecular Life Sciences 74:4027–4044. The Journal of Cell Biology 152:959–970. Acta Crystallographica Section D Structural Biology 72:558–575. Acta Crystallographica. Section D, Biological Crystallography 69:1260–1273. Thank you for submitting your work entitled "Structural basis for isoform-specific kinesin-1 recognition of Y-acidic cargo adaptors" for consideration by eLife. Your article has been reviewed by three peer reviewers, one of whom is a member of our Board of Reviewing Editors, and the evaluation has been overseen by a Senior Editor. The reviewers have opted to remain anonymous. While all of the reviewers appreciated that this work was well executed, after a discussion amongst the reviewers there was a clear consensus that the work did not provide a significant enough advance over other literature in the field to merit publication in eLife. The reviewers hope their feedback will be helpful for revising for publication in another journal. 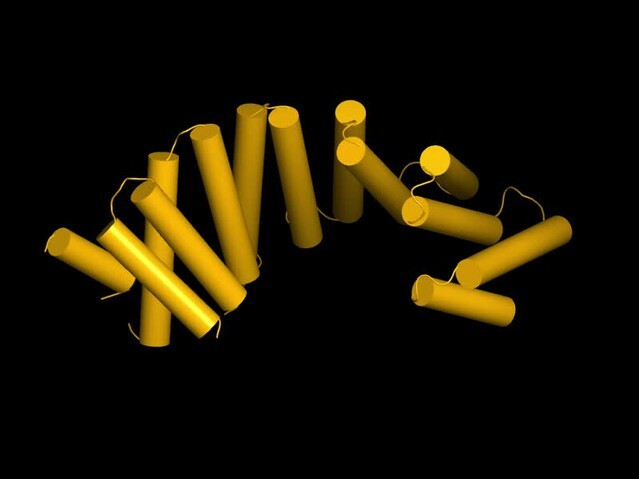 How kinesin motors attach to their cargos remains relatively poorly understood. Kinesin-1 family members (Kif5A-C) exist as heterotetramers with kinesin light chains (KLC1-4). In this study, Pernigo et al. identify a recognition motif that is important for the interaction between KLC1 and a cargo adaptor (JIP1) and a candidate cargo (TorsinA). The authors describe a Y-acidic motif that, as opposed to the previously identified non-KLC isoform specific W-acidic motif, has a strong preference for KLC1 binding. The Y and W-acidic motifs are partially overlapping and adaptors that bind to these sites compete for interacting with the KLC1. This work is technically well executed and provides new information for how KLCs interact with adaptors or cargos. However, given previous work in the field, including studies from this group, I do not find the results presented here to be a significant enough advance to merit publishing in eLife. Journals that focus more on cell biology and the cytoskeleton would be a more appropriate venue for this work. 1) The argument suggesting that KLC1 specificity over KLC2 is due to the N to S substitutions at residues 343 and 469 is not fully convincing given the limited cellular validation. The authors mutate N343S and N469S in KLC1. Do the converse substitutions in KLC2 increase the Y-acidic motif binding affinity for KLC2? It would also be beneficial to characterize the change in binding affinities for the selected mutants as performed for the WT KCL1TPR and JIP1 peptide in Figure 1D. 2) The proposed model for how JIP1 and JIP3 cooperate to activate KLC1 is quite speculative. The data in which JIP1 peptide binding to the KLC1 TPR domain does not affect JIP3 binding affinity is not fully supportive of a cooperative function. The proposed dimerization mediated by KLC1 TPR and JIP3LZ2 should also be further explored. The use of larger protein domains or full-length proteins might be beneficial to account for contributions from other regions of these proteins. Pernigo, Dodding, Steiner and colleagues have identified a novel interaction motif, which they call "Y-acidic," in JIP1 and TorsinA that enables binding specifically to KLC1 but not KLC2. Intriguingly, the Y-acidic motif binds to KLC1 in such a way that it does not interfere with the binding of peptides that affect KLC autoinhibition. This suggests that adaptors with a Y-acidic motif would not automatically trigger kinesin-1 activation, which is in contrast to adaptors with a W-acidic motif. Their Y-acidic-adaptor model is thought-provoking and appealing when considering mechanisms that coordinate cargo binding and motor activation. Overall, the manuscript is well written, and the data are clearly presented. Some questions arise as the authors attempt to translate their structural observations into how the Y-acidic motif would mediate cellular functions (Figure 3D). In their IP experiments, to show that these KLC mutations are acting specifically, the authors should include a mutation that is not predicted to interfere with JIP1 binding. It would also be nice if they could introduce reciprocal mutations in JIP1 to directly test the Y-acidic motif. Similarly, can the authors mutate the KLC2 serines equivalent to N343 and N469 in KLC1 and cause KLC2 to bind JIP1? It would be nice if the authors could provide evidence via cell imaging that co-localization of KLC1 and JIP1 in cells is regulated by the Y-acidic motif, or at least that a cellular function is regulated by the Y-acidic motif mediating an interaction with KLC1/kinesin-1. As it stands, it is not clear whether this interaction may ultimately be redundant with other points of interaction between JIP1 and KLC/kinesin-1 in cells. Pernigo et al. report the binding mode of adaptor proteins to the light chain of kinesin-1 (KLC). They have in particular determined the structure of the binding motif of Jip1 and of Torsin1, C-terminal peptides of about 10 residues, to the TPR domain of KLC1, allowing them to propose a mechanism for the specificity of these adaptors for KLC1 vs. KLC2. To crystallize these complexes, they used a fusion KLC1-peptide protein in addition to nanobodies as crystallization chaperones, an approach that is worth mentioning. And more generally, the structural results justify publishing in eLife. I have nevertheless several concerns which are listed below. 1) The dissociation constant of the complex of KLC1-TPR with the C-term peptide of Jip1 or of TorsinA is in the μM range. Yet the peptides interact quite extensively with KLC1 and one could have expected a higher affinity. The authors mention that the measured affinities are consistent with the results of Zhu et al. But can we exclude an interference of the TAMRA probe used in the fluorescence experiments? An orthogonal method, preferably using unlabeled peptides (e.g. by ITC), performed in the same lab with the exact same buffer and proteins, would ascertain the affinity values. I note that many interactions are of electrostatic nature while the buffer used contains 150 mM NaCl. It is therefore possible that the ionic strength has a substantial effect on the affinity. 2) According to Figure 2B, the TPR binding surface is mostly basic. This is puzzling because the Jip1 C-term peptide contains several hydrophobic residues (in particular the IYL motif). At which level is the electrostatic potential depicted? The same remark applies also to Figure 3—figure supplement 2A and to the TorsinA peptide. 3) Figure 3C indicates that the C-term carboxyl group of Jip1 makes a salt bridge with KLC1. This point is rapidly mentioned in the text (subsection “KLC1TPR-Y-acidic peptide interface”, last paragraph) but not discussed further. It is striking that in both Jip1 and Torsin1 the interacting peptide includes the C-terminal of the protein, as is also the case of the PipB2 protein mentioned in the Discussion. This suggests that the C-term carboxyl contributes substantially to KLC binding. This point could be discussed further (and could be tested experimentally, using a carboxy C-term modified peptide in affinity experiments). 4) I am not an expert in ITC and I could be wrong, but the titration curve in Figure 5A seems weird to me and my understanding is that the first part of this titration curve was not used in the fitting curve. Is the experiment reproducible? For the least, an explanation is needed. 5) It is not clear what the goal of the MS experiment was and what could be concluded (Figure 5C). Do the authors suggest that TPR dimerization is mediated by JIP3LZ2 dimer (according to the title of Figure 5)? The MS data are not consistent with this view, because a KLC1-Jip1 dimer is detected in the absence of JIP3LZ2. In addition, the authors propose that the N-term helix of the TPR domain may mediate KLC1 dimerization. An alternative hypothesis would be that the TPR-Jip1 construct dimerizes via the Jip1 peptide of one molecule that would interact 'in trans' with the TPR domain of another molecule. A control with a construct comprising the TPR domain alone would be welcome. Moreover, because the experiment is performed with an excess of TPR-Jip1 over JIP3LZ2, a 2-1 stoichiometry is not unexpected. It seems to me that a conclusion can hardly be drawn from these data. We thank the reviewers and editors for the opportunity to submit a revised version of our manuscript by Pernigo et al. entitled 'Structural basis for isoform-specific kinesin1 recognition of Y-acidic cargo adaptors'. We believe that we have satisfactorily answered all points raised by the reviewers. We therefore hope that our revised manuscript will be accepted for publication in eLife. We should also to point out that during the submission/revision process of our manuscript two papers relevant to this study have been published: Nguyen et al. JBC, 2018, 10.1074/jbc.RA118.003916 and Cockburn et al., 2018. Nguyen et al. is a biochemical study (almost entirely ITC analyses) of the KLC1TPRJIP1C-term interface. Their study is entirely consistent with our X-ray structure. In fact, the authors use the structural coordinates that we made publicly available at the preprint stage to discuss their results. Cockburn et al. presents the X-ray crystal structure of KLC2TPR in complex with the coiled-coil JIP3LZ2 region. This interaction was also explored by us using ITC and mass spectrometry and the results presented in the current manuscript. Our conclusions are supported by their structural results. This high activity in the field by various laboratories highlights the timeliness of our work that we hope will be made available to the general readership of eLife. Our detailed responses to the reviewers' comments are below. N343 and N469 in KLC1 correspond to S328 and S454 in KLC2, respectively. As requested, we have determined KD values by FP for single (KLC2TPR S328N and KLC2TPR S454N) as well as double (KLC2TPR S328,454N) KLC2 variants using both JIP1Cterm and TorsinAC-term peptides. As suggested by the structure the KLC2TPR S328,454N variant binds both C-terminal peptides with an affinity essentially identical to that of KLC1TPR. These results are now presented in an additional panel in Figure 3 (panel F) and in a novel Figure 3—figure supplement 5 for JIP1C-term and TorsinAC-term, respectively. This experiment therefore further strengthens the argument made in our original submission. Various authors have shown that JIP1C-term binding to KLC1TPR is necessary but not sufficient for kinesin-1 mediated transport of JIP1. Additionally, multiple studies have indicated JIP3 as a protein that co-operates with JIP1 to promote transport by kinesin-1 (Sun et al., 2017, Satake et al., 2013, Hammond et al., 2018). To better investigate this effect in the context of the present study, we have added new immunoprecipitation data in Figure 5A using full length JIP1 and JIP3 as requested. These data demonstrate that co-operative effect and importantly, show its dependence on the Y-acidic interface as defined by the R266S mutation. Our ITC experiments that looked at JIP3LZ2 binding to JIP1C-term-loaded and JIP1C-termfree KLC1TPR (in the revised version also in the presence of the LFP-acidic region as requested by another reviewer) indicate that i) neither JIP1C-term peptide loading nor ii) the presence of the auto-inhibitory 'LFP-acidic' KLC1TPR region has an effect on JIP3LZ2 affinity, which as the reviewer indicates, point to contributions from other regions of these proteins. Taken together, we conclude that JIP1 and JIP3 do act co-operatively, via KLC1TPR, to recruit kinesin-1 and that this requires KLC1TPR binding to JIP1C-term. However, key interactions mediating this effect lie outside of the direct KLCTPR domain interfaces. This point is clarified in the final Discussion paragraph. […] Some questions arise as the authors attempt to translate their structural observations into how the Y-acidic motif would mediate cellular functions (Figure 3D). In their IP experiments, to show that these KLC mutations are acting specifically, the authors should include a mutation that is not predicted to interfere with JIP1 binding. It would also be nice if they could introduce reciprocal mutations in JIP1 to directly test the Y-acidic motif. We have now included new data presented in Figure 3—figure supplement 4A that shows that three mutations (Q222A, E484A, E488A) that lie just outside of the Y-acidic interface (see model inFigure 3—figure supplement 4B) do not interfere with binding, in contrast to R266S that is provided for comparison on the same blot. In addition, a new reciprocal IP (IP for HA rather than FLAG) for R266S is presented in Figure 5A that further reinforces the specificity of assays used here. Finally, in new FP experiments, amidation of the JIP1C-term peptide to remove the carboxy group on the C-terminus eliminates the interaction (Figure 3—figure supplement 1) It is also worth highlighting here the recent study by Nguyen et al. (JBC 2018) that incorporates a variety of other mutations in JIP1C-term that similarly inhibit binding to KLC1TPR. Similarly, can the authors mutate the KLC2 serines equivalent to N343 and N469 in KLC1 and cause KLC2 to bind JIP1? This point was also raised by reviewer 1.This has been done and we have determined KD values by FP for single (KLC2TPR S328N and KLC2TPR S454N) as well as double (KLC2TPR S328,454N) KLC2 variants using both JIP1C-term and TorsinAC-term peptides. As suggested by the structure, the KLC2TPR S328,454N variant binds both C-terminal peptides with an affinity essentially identical to that of KLC1TPR. These results are now presented in an additional panel in Figure 3 (panel F) and in a novel Figure 3—figure supplement 5 for JIP1C-term and TorsinAC-term, respectively. It would be nice if the authors could provide evidence via cell imaging that co-localization of KLC1 and JIP1 in cells is regulated by the Y-acidic motif, or at least that a cellular function is regulated by the Y-acidic motif mediating an interaction with KLC1/kinesin-1. As it stands, it is not clear whether this interaction may ultimately be redundant with other points of interaction between JIP1 and KLC/kinesin-1 in cells. The need for an intact JIP1 C-terminus (which harbours the 'Y-acidic' motif) for kinesin-1 dependent JIP1 transport is very well documented in the literature. For example, in the first paper describing the JIP1-KLC1 interaction, the crucial tyrosine of the Y-acidic motif was shown to be required for the kinesin-1 dependent accumulation of JIP1 in neurite tips (Verhey et al., 2001, Figure 4-5). This was further substantiated in a later paper from the Verhey lab (Hammond et al., 2008) which examined co-operative transport of JIP1 and JIP3 and confirmed that the C-terminal/Y residue was required for efficient transport of the JIP1-JIP3 complex (Figure 7). Kawano et al., 2012 also confirmed that the C-terminal 11 amino acids of JIP1 were sufficient to recruit KLC1 to vesicles although not to activate kinesin dependent transport (Figure 7). Additionally, Satake et al., 2013 show by coIP and IF (Figure 1) that while full-length GFP-JIP1 accumulates at neurite tips in a kinesin-1 dependent manner, GFP-JIP1-dCT (dCT = delta C-terminus, lacking the final four amino acids that are an integral part of the Y-acidic motif) does not. GFPJIP1-dCT shows fluorescence intensity at the tips comparable to that of GFP alone. In this paper the GFP-JIP1-dCT construct is even used as a 'de facto' negative control to assess the relative impact of other JIP1 mutations on kinesin-1 recruitment. Although all the above references were already citied in the original submission we have further clarified in the revised text that an intact JIP1 C-terminus (containing the Y-acidic motif) is necessary (although not sufficient) for kinesin-1 transport mediated by KLC1TPR recruitment. Experimentally, our new IP data presented in Figure 5A using full length JIP1 and JIP3 demonstrates that they interact co-operatively with KLC1TPR and, importantly, show its dependence on the Y-acidic interface as defined by the R266S mutation, further highlighting the importance of this interaction site. The discussion has been expanded to include further consideration of this point. At the request of this reviewer we have determined thermodynamic parameters for the binding of unlabelled JIP1C-term to KLC1TPR using ITC. The experiment was carried out at 500mM NaCl as KLC1TPR tends to precipitate in the cell at low salt concentration upon stirring. FP measurements at this NaCl concentration give KD = 10.37 ± 0.45 µM and ITC measurements give KD = 11.66 ± 1.85 µM. The two measurements are therefore entirely consistent with each other and confirm that the TAMRA label does not interfere with binding. The ITC data and relative thermodynamic parameters for this experiment are reported in a novel Figure 1—figure supplement 2 in the revised manuscript. The interaction between the KLC1TPR domain and Y-acidic peptides elucidated in this work and also that between KLC2TPR and W-acidic peptides studied in our previous work (Pernigo et al., 2013) has an electrostatic component (peptides are acidic and the concave surfaces of KLCTPR domains are positively charged). The effect of ionic strength of the interaction between KLC2TPR with and W-acidic peptides of the cargo adaptor SKIP was investigated to some extent in our 2013 paper. At the request of this reviewer we have now also explored the effect of varying NaCl concentrations for both the KCL1TPR-JIP1C-term and KLC1TPR-TorsinAC-term interactions. In the case of KCL1TPR-JIP1C-term, KD values are 0.48 ± 0.06 µM and 10.37 ± 0.45 µM at [NaCl] = 85 and 500 mM, respectively, while for KCL1TPRTAMRA-TorsinAC-termKD values are 1.23 ± 0.10 µM and 29.9 ± 2.8 µM at the same NaCl concentrations, respectively. Therefore, as expected from our previous work, there is an electrostatic component to the binding. Our choice of [NaCl]=150mM for most FP measurements allows for high affinity interactions while minimising KLC1TPR precipitation. All FP measurements at varying NaCl concentrations are now presented in a novel Figure 1—figure supplement 1 in the revised manuscript. We used consistent threshold values (+10kBT/e (blue) to -10kBT/e (red)) to depict the electrostatic potential in all surface representations. As mentioned in our reply to the previous point and consistent with this reviewer's suggestion the binding does contain an electrostatic component. Therefore we consider not too puzzling that the overall character of the receptor surface is basic given the overall acidic nature of the cargo adaptor peptides. Threshold values are now explicitly mentioned in the relevant figure legends. Both Jip1 and TorsinA use their carboxy termini in the interaction with KLC1TPR. The suggestion by this reviewer to use a C-term modified peptide is an excellent one. To this end we have synthesized a modified TAMRA-JIP1C-term featuring C-terminal amidation. We find that a free carboxylic group in JIP1 is absolutely required for the interaction. This piece of data is now presented in a novel Figure 3—figure supplement 1 in the revised manuscript. The first part of the titration shown in Figure 5A (Figure 5D in the revised figure) was also used for fitting and it is not a question of reproducibility. The reason why the height of the first portion of this thermogram is different is because we used a smaller injection volume compared to subsequent ones in an attempt to better sample the initial portion of the curve. We have now mentioned this explicitly in the legend. The main purpose of the experiment was to provide an orthogonal observation of the stoichiometry of two KLC1TPR bound to the JIP3LZ2 coiled-coil dimer suggested by the ITC experiment. The MS data indeed show a complex of this stoichiometry. While our manuscript was under revision Cockburn et al. have published the crystal structure of the KLC2TPR-JIP3LZ2 complex that is entirely consistent with our observations. Given the availability of this new crystal structure we have moved our MS data to the supplementary information (Figure 5—figure supplement 1) and added the relevant reference to the text. The X-ray crystallography work was conducted at beamline I04 of Diamond Light Source (Didcot, UK) and at beamline P14 of Petra III/DESY (Hamburg, Germany). We are grateful to the staff scientists working at these beamlines for their excellent technical support. © 2018, Pernigo et al.